The DotScope mini defines a new performance class under the microscopes for gravure printing. All components are tuned for maximum productivity. Measurements can be performed and stored without the instrument must be placed out of hand. The measurement is made in general automatically and the refocusing can often be dispensed with. DotScope mini, the compact portable microscope. With two buttons on the unit, the DotScope can perform the functions "record image and automatically measure", "save measurement" and "live image", so that the microscope for successive measurements must not be put out of his hand. The workflow is thereby very efficient. The stored measurements can be loaded later, checked and corrected or supplemented. Particularly fast can you work with the serial measurement. Here is specified how many measurements in the layout X x Y should be carried out. If you have, for example, a cylinder with 12 color wedges with 10 printing densities, you specify 12 x 10 measurements. Now you can with the DotScope without the device out of his hand to give perform 120 measurements. The result is a table of 12 x 10 average measured values per measurement. The corresponding measurement can be opened by clicking on the respective table field can be checked, corrected if necessary and stored again. Experience has shown that in this way you can work as a factor 5 faster than with conventional measurement technology. The DotScope mini has an xy adjustment, which means that the details of a print form can be approached precisely. The y-adjustment has an infinite adjustment range, ideal for making measurements along a vertical line. The image processing software automatically measures reliably all cells in the picture - even full tone areas with narrow walls. For automatic measurement the screen of the engraving is determined automatically and all cells measured in the image. The operator can specify which and how many measured values are to be displayed in the picture. The automatic measurement also measures reliably full tone areas with narrow walls. Through edge interpolation a subpixel accuracy resolution is achieved. Therefore, one usually works with the DotScope with the lens 5x or 10x. 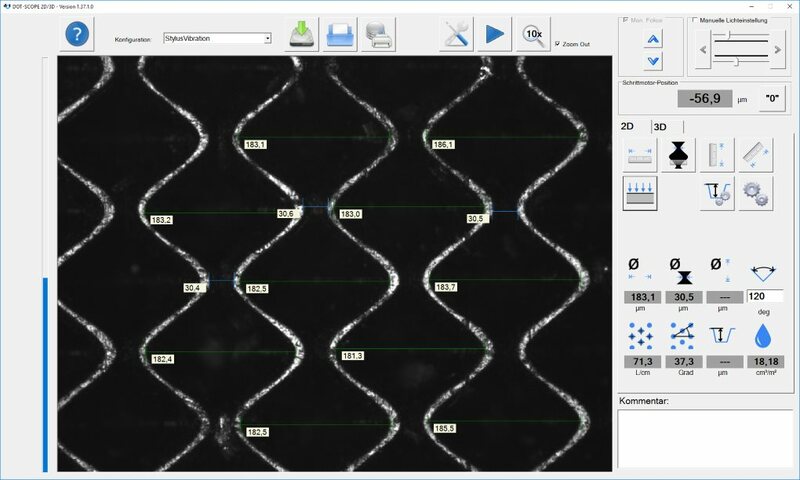 In the larger measurement field more cells can be detected simultaneously. The 20x lens is then used only for documentation purposes, when it comes, so to create the widest possible picture of small details. Of course, also it can be measured manually. Here you can either start with an automatic measurement and correct them or freeze an image and now measure individual details. For this, the tools "horizontal measurement", "vertical measurement" and "free measurement" is available. Within an image virtually any number of measurements can be entered. The construction of the foot holds the focal plane, so that even with changing cylinder diameters hardly needs to be refocused. The focus is supported by an image sharpness display, so that always and repeatable optimal focal plane is adjustable. Optionally, the DotScope mini is also available with a z-measurement.